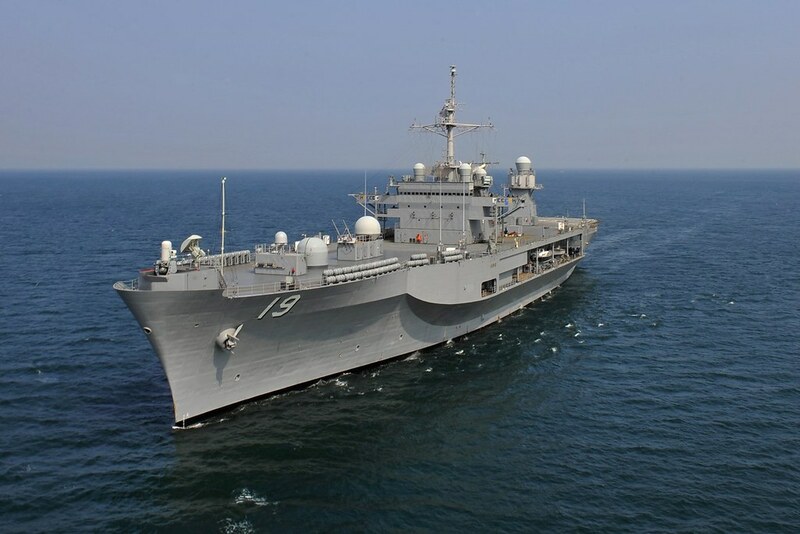 SINGAPORE - The U.S. 7th Fleet flagship USS Blue Ridge (LCC 19) arrived in Singapore for a regularly scheduled port visit, March 13, strengthening multilateral relationships in the region. The Blue Ridge team consists of more than 900 members, including embarked 7th Fleet staff, Marines from Fleet Antiterrorism Security Team Pacific (FASTPAC) and the “Golden Falcons” of Helicopter Sea Combat Squadron 12. Sailors will participate in four different community service projects, conduct embassy security training and take the time to experience the local culture and food during the visit. FASTPAC Marines will conduct an engagement with the U.S. Embassy Singapore Department of State Security, focusing on improving embassy reinforcement plans. Additionally, FASTPAC will provide combat life saver, rifle and pistol marksmanship training. During downtime in port, some Sailors will also take advantage of the opportunity to participate in Home Hospitality, a program hosted by the American Association of Singapore. This program offers various forms of hospitality, where local families volunteer to provide a home cooked meal, arrange a poolside party or take Sailors on a tour of Singapore. Blue Ridge has been forward deployed to Yokosuka, Japan, for 36 years. As the flagship for Commander, U.S. 7th Fleet, Vice Adm. Joseph Aucoin, Blue Ridge is committed to strengthening and fostering relationships within the Indo-Asia Pacific region.